Birding Is Fun! : Birding in a "Fake Hammock"
The path to our favorite birding patch is only a few paces outside our subdivision's entrance gate. However, we must reach the gate by walking past about two blocks of residences. Clothed in our rugged garb, we accept quizzical stares from passing motorists, all dressed up as they bring their kids to school or head for the office. 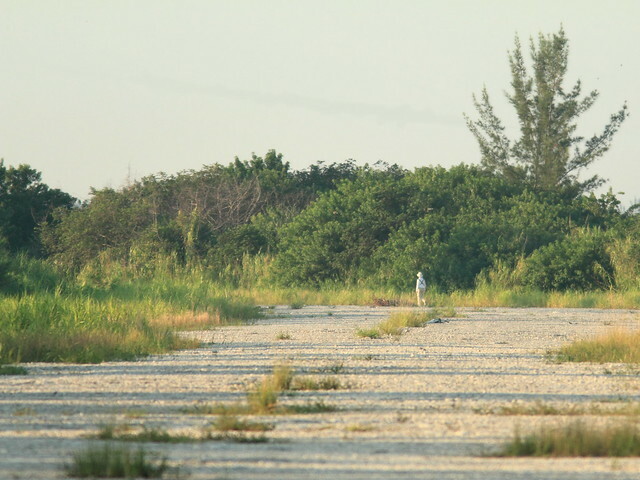 We are often recognized as birders, and have acquired some legitimacy by answering questions from neighbors, such as, "Did you notice that a lot of baby white cranes [translation: Snowy Egrets] have just joined their parents [translation: Great Egrets] along our lake?" Here in Florida we must pay special attention to protection from sun and insects. Sensible wide-brimmed hats, trousers tucked into socks and long sleeves on the hottest of mornings make us stand apart on the fashion scene. No wonder Mary Lou regarded all birders as rather eccentric folk-- until she became one herself! The latest additions to my wardrobe and gear have been an insect-repelling shirt, waterproof snake-resistant boots and an OP/TECH Dual camera/binocular harness. Here I am, all decked out and ready for action. Photo courtesy of Mary Lou. The harness solved a vexing problem. Until now I carried my camera and binoculars slung over my neck and opposite shoulders. This is a troublesome arrangement. Not only do the straps conflict with each other, pinching and constricting my neck all around, but their business ends can become hopelessly entangled. It's very disconcerting to lift the camera for a shot and find the binocular strap wrapped around the long lens. The harness (or halter) stores the two items of equipment independently on each side and distributes their weight on a single soft neoprene yoke that goes over both shoulders and is secured by a chest strap. Strangulation is out of the question. The snake boots are something else. A few close encounters with Water Moccasins notwithstanding, I am usually very careful about looking where I step and am not afraid of any snakes-- provided I see them first. My attitude changed a couple of months ago, when (wearing sneakers) I went out in the pre-dawn darkness to try to obtain a photo of one of the Bobcats that live in the wetlands. I forgot to take a flashlight and depended upon the moon and a little key chain LED lamp to light my way. This was fine until I had to cross some deeper grass, and felt I might be taking my life into my hands. 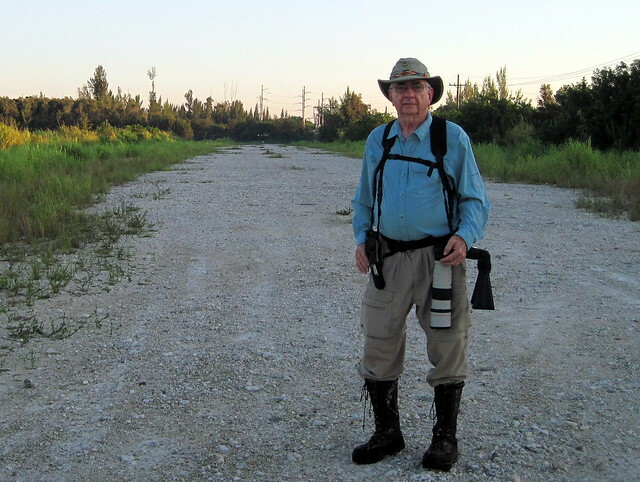 Indeed, another photographer who walked out that way a couple of mornings earlier and obtained a knock-out Bobcat portrait, told me he saw four small Water Moccasins along the same path. Why didn't I see any? This experience, and prodding from my spouse, son-in-law and daughter, as well as a couple of birding friends, led me to finally buy the snake boots. 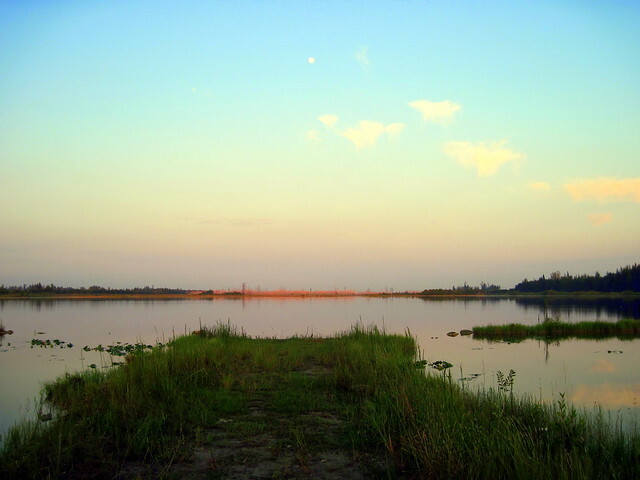 This past Friday, we got out about ten minutes before sunrise and took our usual warm-up "power walk" to the Harbour Lakes Impoundment, a lake about a mile away from our gate. Here, a day-old full moon hovers overhead, and the first rays of sunlight have just reached the trees on the far side of the lake. 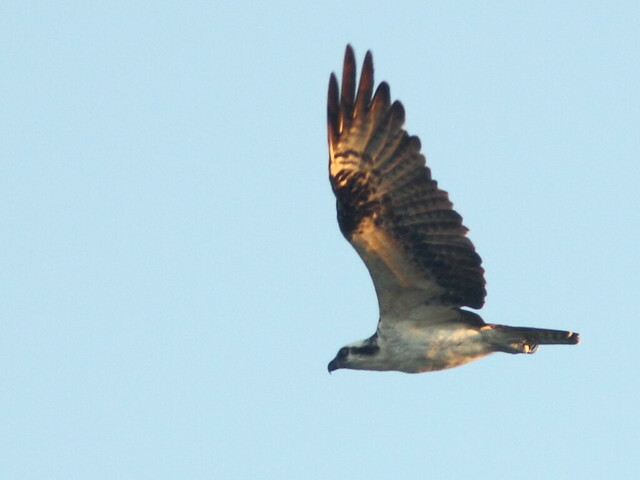 An Osprey flew over, the early rays illuminating its flight feathers from below. 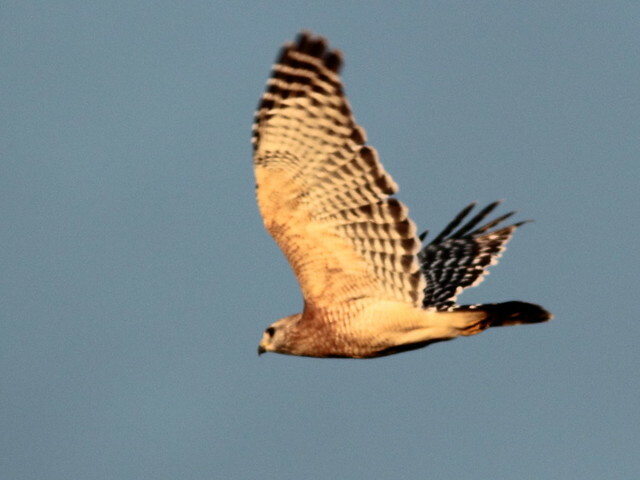 A Red-shouldered Hawk followed close behind the Osprey. Truth be told, I just don't take one picture and move along. Usually I shoot as soon as I spot my subject, then move in cautiously for better views. Rather than shoot in bursts, I like to catch the bird in action while calling, preening, or looking up, down or over its back. Such poses seem more interesting than simple "field guide" side-on views. If a twig or leaf is in the way, or part of the bird is in shadow, I try to angle around it or wait until the bird moves into a more suitable location. Approaching nearer to the subject requires stealth and slow movements. Each bird seems to have a limit as to how closely it may be approached. 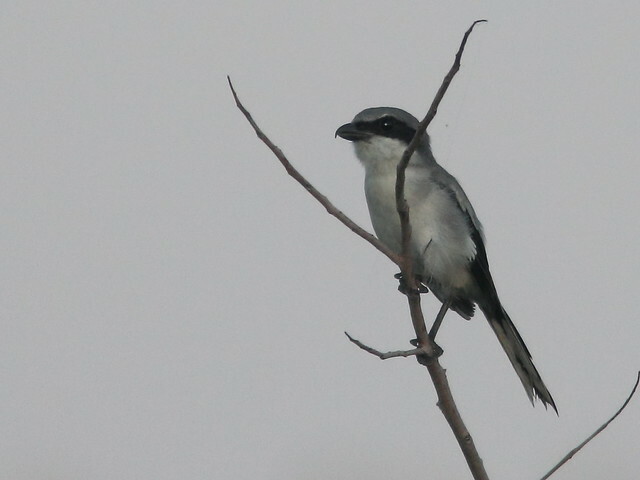 The shrike usually flies off if someone gets within about thirty feet, though there are exceptions. All this takes time and can be very BORING to a non-photographer birding companion. I know this from experience, having taken up photography only recently, and used to hate it when photographers held up other birders' progress. 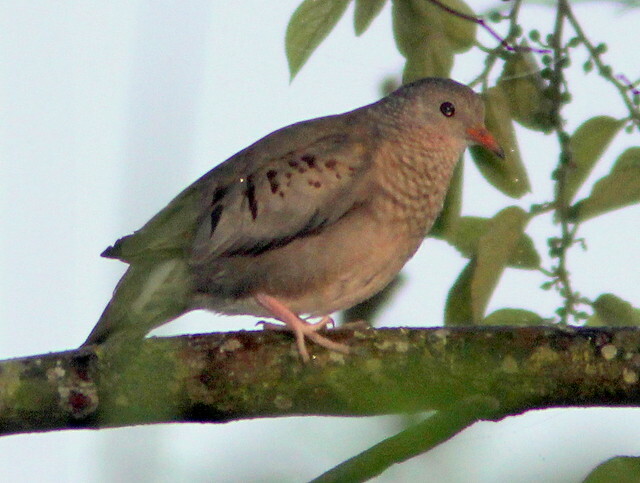 Therefore, Mary Lou usually leaves me with my camera and starts birding her way back home within an hour, alone. That's her, fading away in the distance. Look closely at the above photo. Mary Lou is just passing the small, compact wooded area that I call my "fake hammock." Although it is an isolated area of hardwoods and is dry underfoot all year long, it otherwise bears no resemblance to a "real" hammock, which is an elevated island in the Everglades, populated by native oaks, mahogany, maples and palms. While my fake hammock contains ligustrum, exotic Brazilian Pepper and lantana, it also has several large native Florida Trema trees (Trema micranthum) with an endless crop of nutritious berries that continue to ripen all winter. These trees are very attractive to wildlife. The first time I heard a Florida birder talk about finding birds in a certain “hammock,” I wanted to correct him. Up east, the only hammocks I knew were made of canvas and slung between two posts. I thought he meant to say “hummock,” a word that I first heard used by a farmer, who pointed to a hill out in the middle of his hayfield that was too steep to mow and had gone over to shrubs and trees. Of course, I’ve since learned that “hammock” has a very specific meaning in any discussion of Everglades ecology. It can be quite cool in the deep shade of a hammock. My only experience in walking through a hammock was on trails in Everglades National Park. 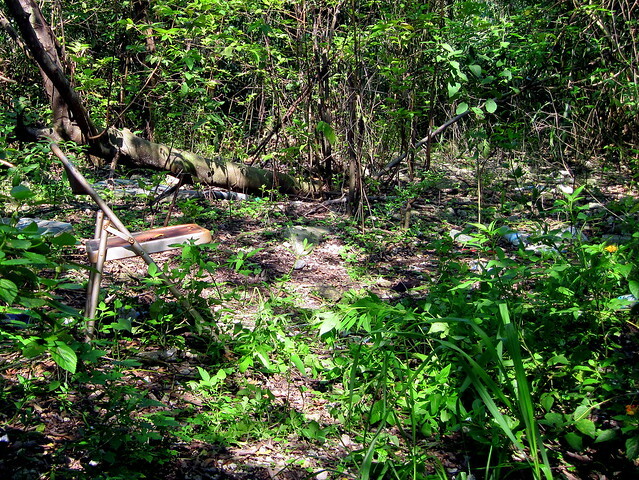 In my neighborhood, the land has been drained and filled, and true hammocks are long gone. However, I did find this very lame imitation of a hammock at the edge of our subdivision, where for some unknown reason, the landscapers have allowed trees and shrubs to grow undisturbed. 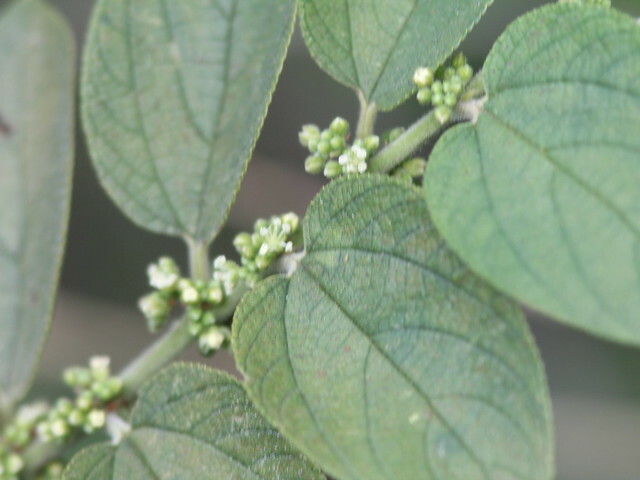 Trema berries grow along the stems of the tree and are in various stages of ripening. I had not entered my "fake hammock" since spring, and found the path that led into it overgrown with high weeds, vines and shrubs. I would never have ventured there without my new snake boots, but I forced my way through the tangled vegetation. Once inside, I found very little ground cover in the rather open shaded area. An old folding chair had been left there a long time ago and it provided a nice place to sit and just wait for the migrating birds. 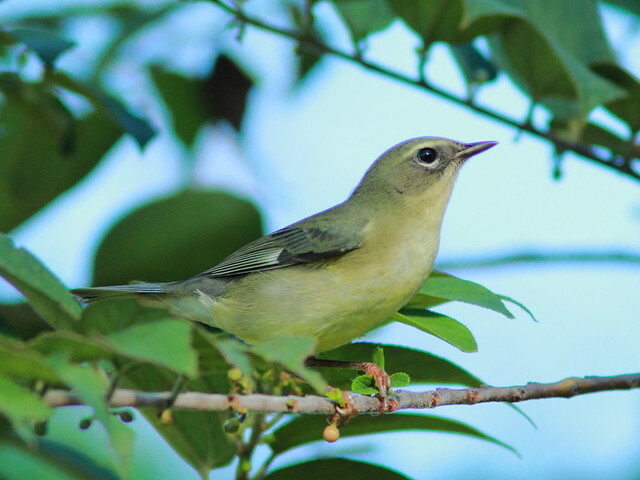 I did not have to wait very long, as two vireos suddenly showed up to partake of the Trema berries. 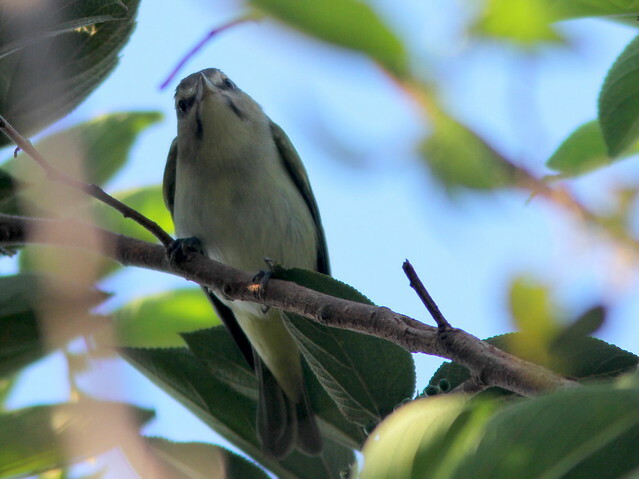 One bird's markings suggested it might be a Black-whiskered Vireo, but other views confirmed it was a common Red-eyed Vireo with "bad hair." 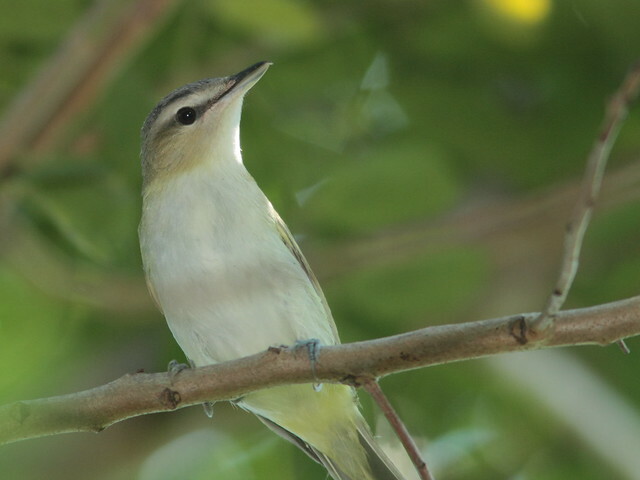 No doubt about it-- they were indeed Red-eyed Vireos. 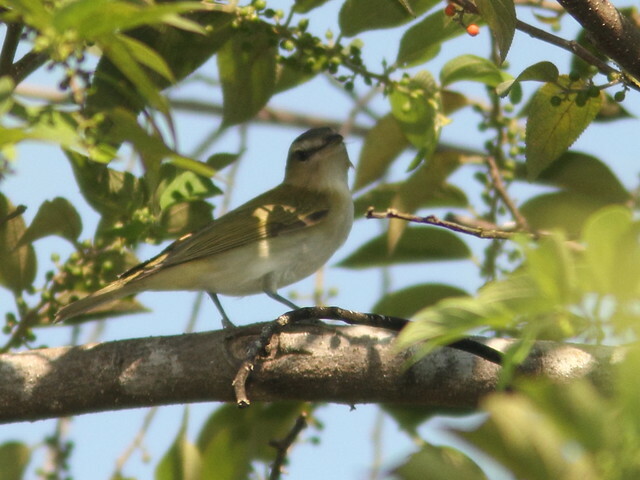 For comparison, here is the much less common Black-whiskered Vireo that I photographed earlier this year in the same tree. 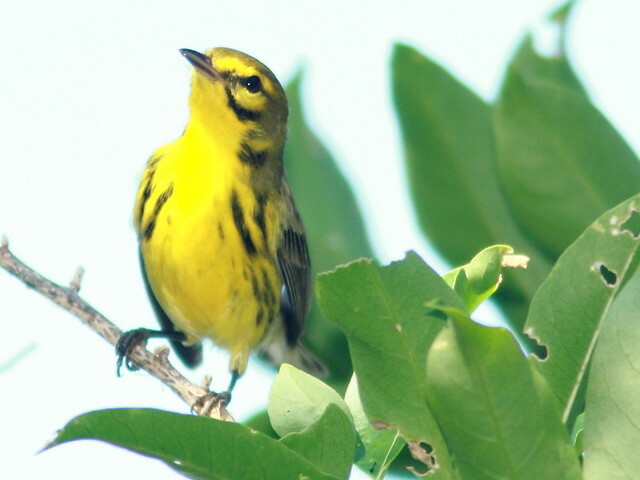 Just above my head, a male Prairie Warbler foraged in a sunny patch of leaves. A noisy group of three Red-bellied Woodpeckers flew in, allowing me to pull off a couple of lucky shots before they disappeared. 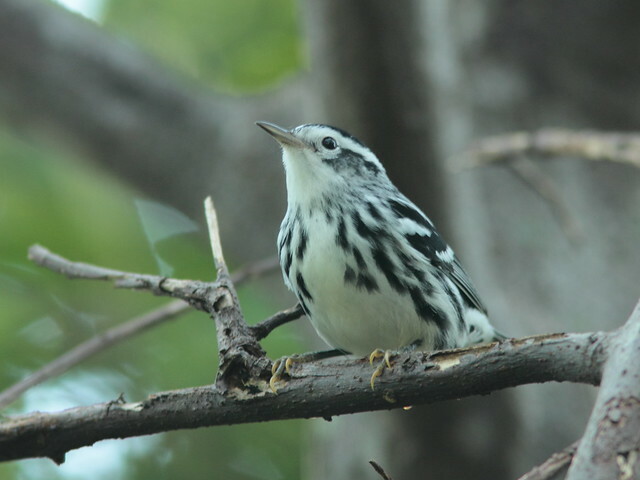 There were very few mosquitoes and no deer flies, and it was almost cool inside my hiding place, as I watched a Black-and-White Warbler work its way toward my position. OK, I overdosed on Black-and-Whites. I probably took over one hundred shots, almost all through peep-holes between the branches, and most marred by the rapid movement of this little sprite. Then it came into the open and I finally got some full views. 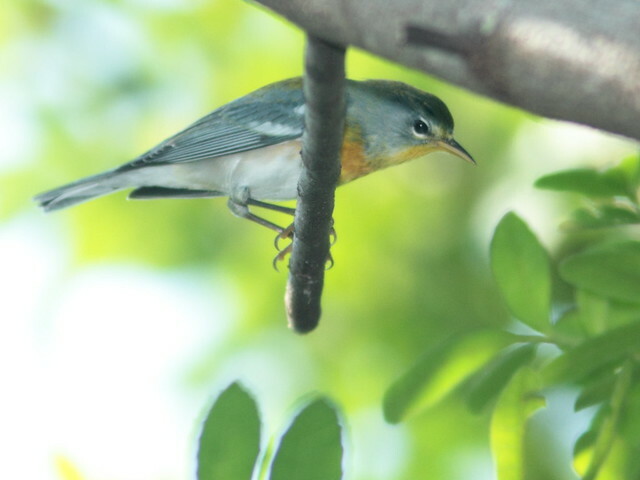 A Northern Parula peered down at me from the canopy. 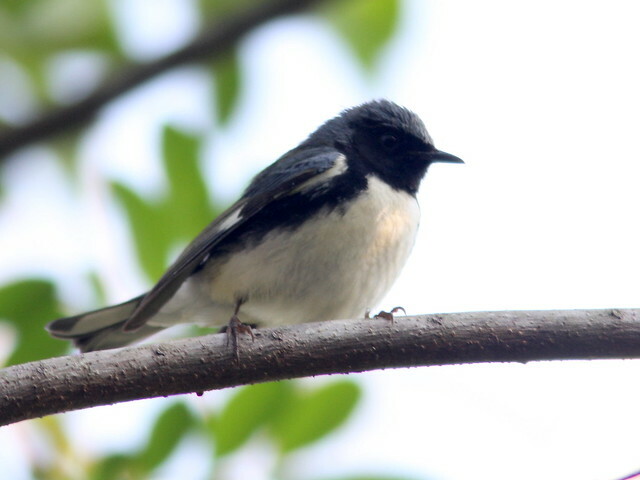 A male Black-throated Blue Warbler joined him. 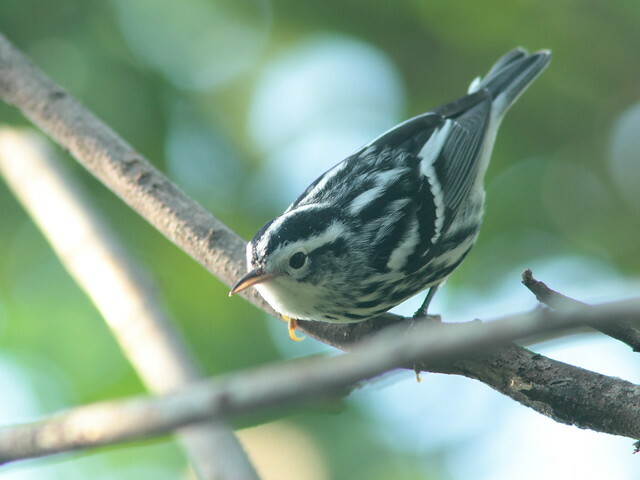 The otherwise dissimilar female Black-throated Blue Warbler shares the male's field mark, a white wing patch. 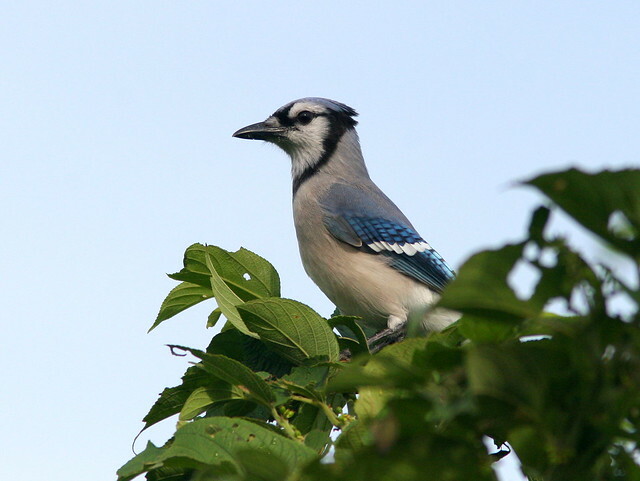 The Blue Jays have completed their molt, and this jay looked sleek and handsome. 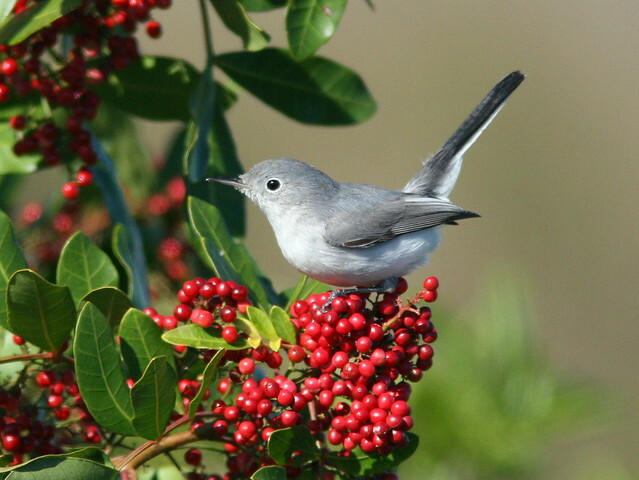 Blue-gray Gnatcatchers were almost as distracting as the many butterflies that fluttered in my peripheral vision. One perched on a clump of exotic Brazilian Pepper. A Baltimore Oriole was a surprise visitor. 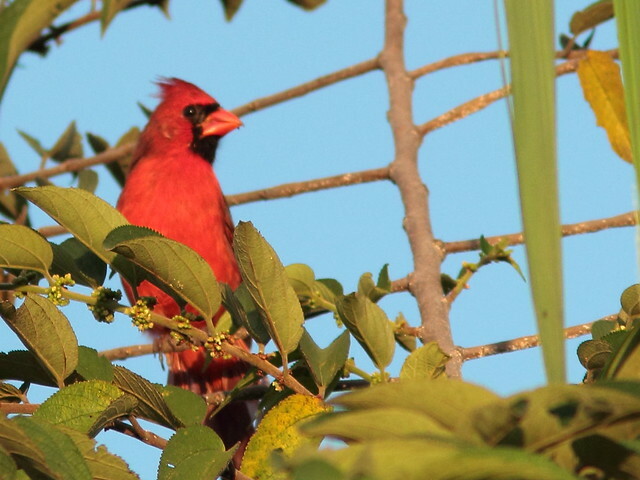 A male Northern Cardinal gobbled up the Trema berries. 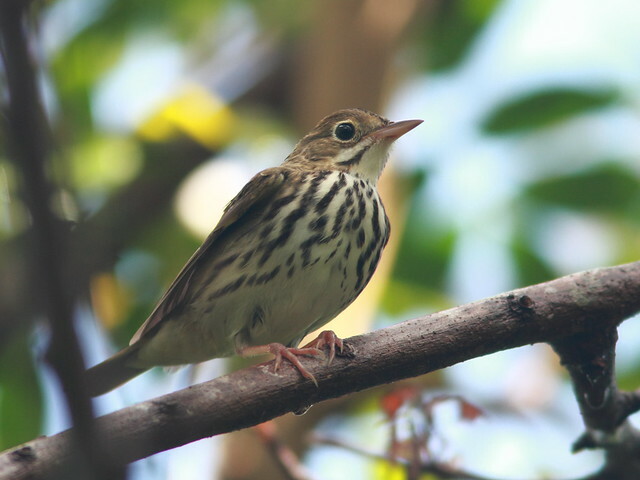 For me, the real treat was a pair of Ovenbirds that chased each other back and forth, rarely sitting still long enough for decent portraits; this one insisted on hiding behind a leaf as it eyed me. 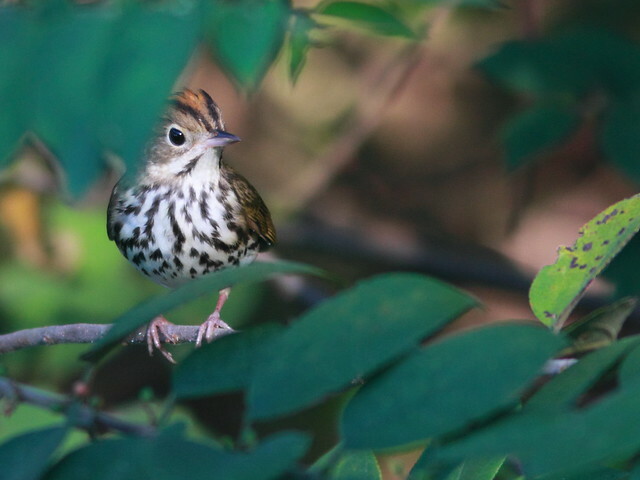 The other Ovenbird never perched nearby, requiring me to shoot through holes in the foliage into its shaded retreat. 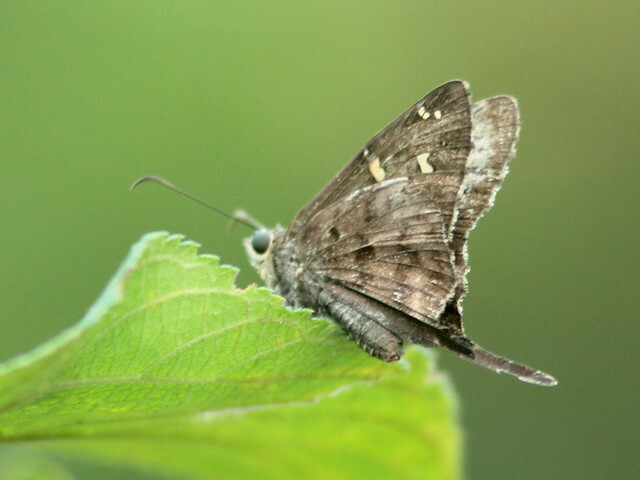 This little tailed butterfly is a Dorantes Skipper. 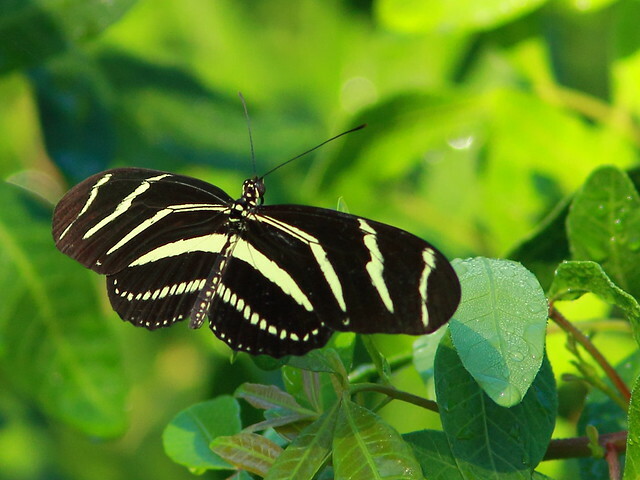 The most numerous butterflies were Zebra Heliconians, the State butterfly of Florida. Very nice pictures. 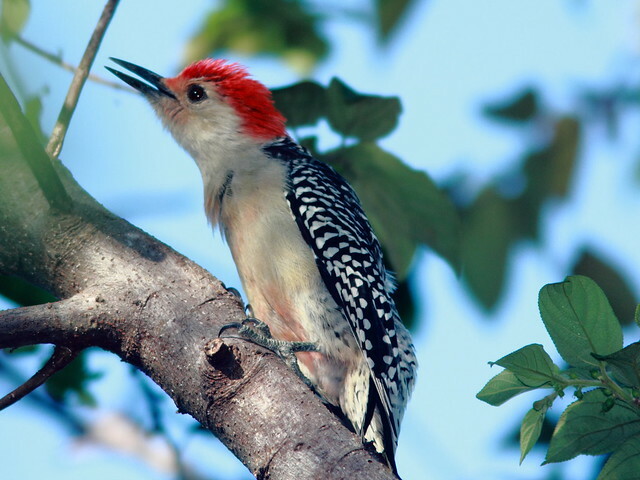 The photo of the Red-bellied Woodpecker is my favorite. Great little patch you got there! Nice photos. The Blue Jay is my favorite. Wonderful collection of birds and photos. Very nice post and I like the boots, makes me glad I don't have to watch where I step as much here.